The Conversation Project - http://theconversationproject.org - An organization dedicated to helping people talk about their wishes for end-of-life care. Death Café - http://deathcafe.com - At Death Cafés people drink tea, eat cake and discuss death. Their aim is to increase awareness of death to help people make the most of their (finite) lives. Death Over Dinner - http://deathoverdinner.org - Resource for people getting together to have dinner and have conversations about how we prepare for and spend our final days. Graceful Passages: A Companion for Living & Dying. www.gracfulpassages.com - A gentle and compassionate double CD Gift-book intended to help anyone facing the difficult fears surrounding disease, mortality, or life-changing transitions -- their own or someone they care for. 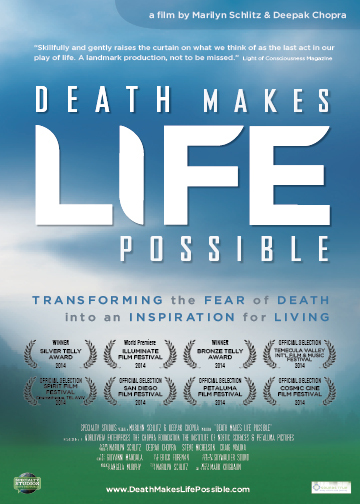 National Public Radio Interview - A NPR interview with Marilyn Schlitz on the subject of Death Makes Life Possible. Recorded on October 13th, 2014.